During my great-grandmother’s generation,the Hard Timers generation, women were baking. There were less store-bought items, industrialized food had yet to exist, and as the depression took hold, this generation had to wing-it when it came to cooking. They left behind many recipes—showing their creative skill to get a little flour, water—and when they had it—milk, butter, and eggs into their baking. It may be the reason pie making, which began in the late 1800s, survived during the depression, since only flour, fat, and water are needed for a piecrust. And so, from my great-grandmother down to me,her piecrust recipe has endured. Thanks also to the diligence of my great-grandmother’s generation, we have many recipes, some simple from leaner times and others more extravagant, opening a window into a world that no longer exists. One of our family’s favorites: Pocket Pies (the baked version of a fried pie). She would make a piecrust, roll out the dough, cut it into medium-sized moons, fill the moons with some kind of fruity goodness, fold them into pockets, and bake them into crispy-hot goodness. My great aunt Clara was also an avid baker. She could make a coconut cake from scratch. She’d blast open a coconut with a hammer, grate its flesh and bake it into sumptuous vanilla cake into which she would pour the coconut milk. Aunt Clara would then make boiled icing (try it… it’s insanely difficult), and after the cake was iced and happy on its stand, she would then dust the whole thing with flaky coconut. Ahhh. Food nostalgia. My great-grandmother never personally served me one of her pocket pies, but thanks to the recipe, her daughter made them, and her daughter’s daughter, and thus so have I. However, I was lucky enough to partake in Aunt Clara’s cake, but when I tried to make it, I discovered she was actually a super hero with silver hair, because it was near impossible, and I failed miserably. Several years ago, my mother discovered she could no longer eat gluten. Then a friend was diagnosed with having Celiac disease. I had other friends telling me they had gone gluten-free because they had an intolerance or an allergy. Others told me that they were no longer eating bread because their bellies would swell and they’d get rashes. Why was this happening all at the same time? It’s hard to be told that from now on, for the rest of your life, you won’t be able to eat wheat. Five years later, chefs, cooks, nutritionists, and a variety of food companies have risen to the occasion, and now it is pretty easy to find gluten-free options in grocery stores and restaurants—unless, that is, you are in smaller towns. Supply is still getting into the nooks and crannies of America. It’s hard to be told that from now on, for the rest of your life, you won’t be able to eat wheat. Even though the body is now in great relief, and one can begin to recover and feel healthier once again; the victory is still emotional, and there is an amount of grieving that must be done. So what do we do with the recipes our ancestors left behind? How can I make a piecrust the whole family can eat? How do we care for our friends, family members, or even ourselves if it is impossible to have modern-day gluten in our diets? her personal story about her gluten issues. He was writing a cookbook and had wondered if she would contribute, and she did. The book was very well received, and he went on to write a number of other cookbooks to help people with various issues. I don’t know why, but I never read it. Maybe it was because I had no issues with gluten; maybe I was just too distracted by other things. However, the people in my life with these issues continually increased, and after some terrible attempts at creating my own gluten-free pancake batter, I was thankful the book returned to my hands. It is heart-felt and thorough—and I truly believe—it is the book that should be kept in bulk and on hand in every doctor’s office, so that when someone is diagnosed with a gluten issue, it is the first thing patients should have in their hands as they begin a new dietary life. The first half of the book divides and conquers the issues, explaining the difference between an intolerance and a disease, etc. (Thankfully it has a friendly tongue-in-cheek tone. Who wants to read an encyclopedia when they’re hungry?) 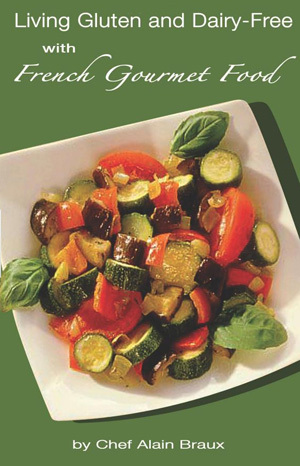 The second half is filled with beautiful recipes. There are dessert recipes such as Orange French Crèpes with Grand Marnier or Pear Tarte with Almond Cream, as well as a ton of savory recipes like Quinoa Risotto with Red Bell Peppers or Tuna Côte d’Azur-style. And probably the most important thing of all—LISTS. What the heck are you supposed to shop for? How do you know if this crazy scientific ingredient you’re reading is a gluten culprit or not? The lists bring gluten-free folks out of no-man’s-land and put them back in the kitchen. So now I felt armed and ready to feed my friends and family again, but most importantly, with a little more education, I could now begin adapting my family’s recipes so that regardless of the “why” behind this wave of food issues, we can still eat. It will take me a little time to experiment, but I want to be able to make my Aunt Clara’s coconut cake and my great-grandmother’s hand pies, feed them to my mom and watch her smile. After the depression and WWII were over, women were expected to excel in their exploits in the kitchen. Their men were home. The economy was improving. It was time to play “Leave it to Beaver” in style. More pies were invented. Cakes became giant, tall, and fluffy. Modernization and simplifying the life of a housewife were all the rage. The TV dinner sprang into our lives. Canned spaghetti made us feel like the Jetsons. Food began to change. Something else began to change during the Hard Timers’ and Baby Boomers’ generation: bread making. In 1928, Otto Frederick Rohwedder created the first machine that would slice and wrap bread. And in 1961, the machines that could mix and knead and bake the loaves began in full force. We were cutting edge. We were modern. And eight years later, we’d walk on the moon. world hunger, combined international efforts to create a type of wheat with shorter sturdier stalks and large grain-filled heads, which was also easier to harvest with modern equipment. He succeeded and won the Nobel Peace Prize for his efforts. 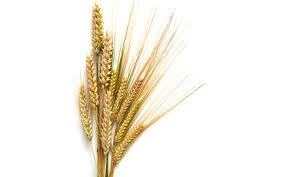 Through these events our modern wheat was born. In the 1980s, genetically engineered wheat began to appear. One of the genes on which they were working was the gluten gene. By adjusting this gene, our pretzels could look like even bigger, contortionist pretzels. Our breads could handle just about any pan or oven that existed in any factory. Higher gluten meant better-behaving bread. It has not been formally proven that this is the reason so many people today can no longer tolerate gluten in their bodies, but theories that support the idea seem strong. When we wonder why our great grandparents could nurture themselves on “amber waves of grain” and today there are more intolerances, diseases, syndromes, etc.—all in relation to wheat—these theories just may have some ground. 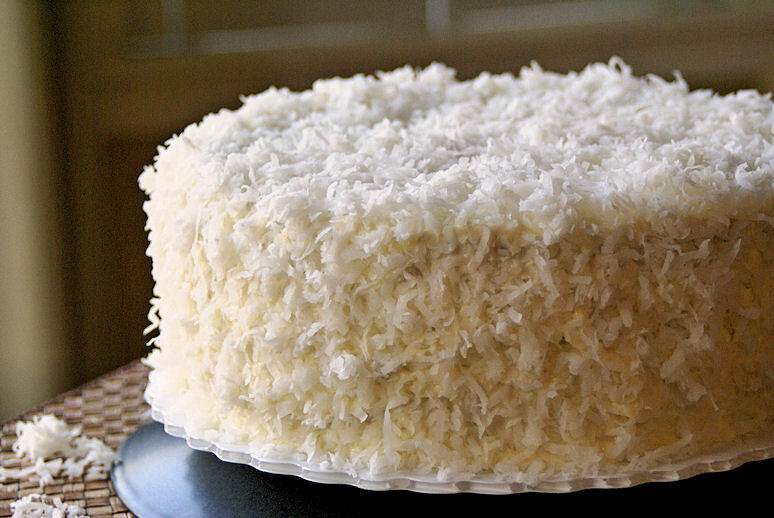 Coconut cake image by Simple Thai Food Recipes.